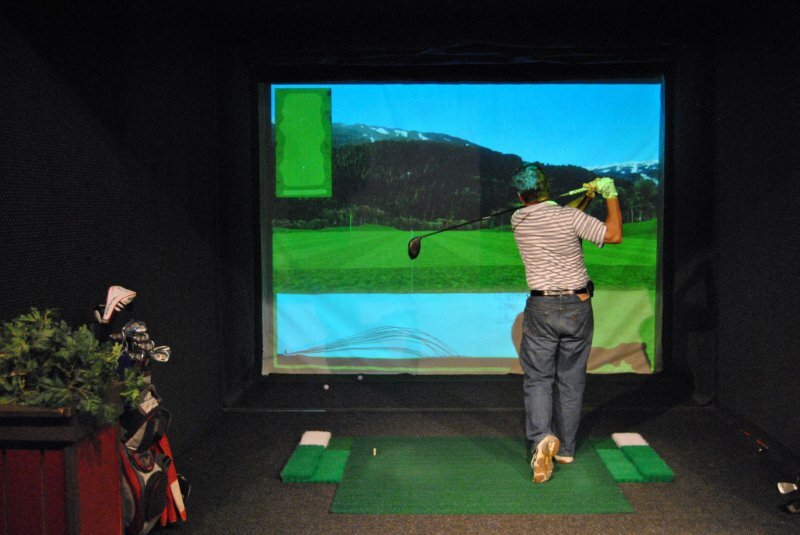 WE HAVE 11 STATE OF THE ART FULL SWING GOLF SIMULATORS. FULL SWING IS THE WORLD WIDE LEADER IN GOLF SIMULATION TECHNOLOGY. Jordan Speith, 2015 PGA Tour Player of the Year and FED EX CUP champ uses our simulators. 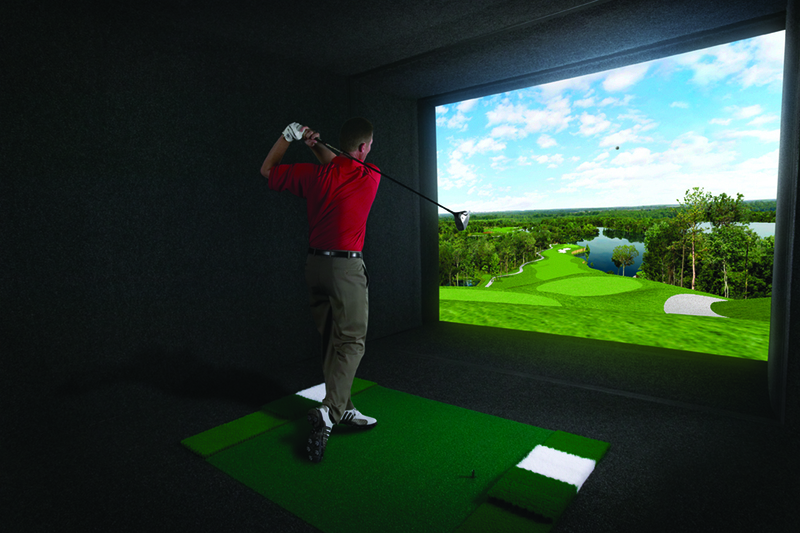 Playing golf on our simulators is very much like playing outdoors. Like outdoors, you use your own clubs and balls. Most people do, although rental sets are available. Practice / warm up: Before you play your round, you can loosen up on the practice range. Hit some different irons and drives; practice approach shots on our short game range, and even take a few practice putts. Hitting surfaces. We have different mats to simulate fairway, rough and sand. And we provide rubber tees with different heights for your tee shots. Distances. You should find that your distances on the simulator are very close to what you do outdoors. Some stronger hitters may find they get a little more distance. Getting started. First you get to pick a course to play from a selection of 50 world-class sites. You can choose various playing conditions as listed below. Your first view on the large 10 ft by 12 ft screen is a very clear, life like image of the real course you have chosen with the real topography. On the tee. You will see the fairway ahead of you, as well as the rough and nearby trees and hazards, just as you would if you were playing outdoors. You may see the green in the distance on long holes, unless you are playing a dogleg. On par 3’s, the green and flag will be in clear view, just like on a real course. Aerial view. Before you start a hole, or at any time, you can get an aerial view of the hole to get an appreciation of the layout, and also be able to get distance information to trees and other hazards that could come into play. Fire away. When you tee off, aim as you would outdoors, down the fairway or right at the flag, and make that great shot. Upon contact, sensors capture the speed, direction, trajectory and spin of your golf ball, and instantaneously project an image of the ball in flight on the screen. You will ultimately see it land and bounce following the actual topography of the course. Play. Once everyone has teed off, you will see a new view of the player farthest away, and play the hole out just like you would outdoors. On the Green. You putt right into the screen. Putting requires that you get a feel for the speed of the greens, adjust accordingly for uphill or downhill putts, and play any break (left or right) that you will be able to see on the green. It’s just as challenging as outdoors. With some luck, you can sink a 60 footer for a birdie. Hole-in-one. Yes you can get a hole-in-one if you hit a great shot or get a lucky bounce! Tee boxes: Blue, White, Red, Junior. Wind, green firmness and speed. Pin positions, from easy to difficult, gimmie distances. Modes of Play: Stroke, Match, Scramble, Stableford, Skins. Power boost available for novice golfers. Rule of thumb, it takes about one hour per person to play 18 holes. So a 2some will take about 2 hours to play and a 4some will take about 4 hours to play. When you book a tee time, this is how we allocate playing time for your group. We typically add on, when possible, an extra 1/2 hour per group for warm up time and possible delays. A lefty practicing his Tee shots. Notice ball in flight right down target line. Lower bottom section shows the trajectory of his shots. We have 3 different practice ranges. * Full driving range, where you can hit any shots. * Short game range, where you can hit short irons to a flag at different distances. * Chipping/putting area, to practice these elements of your game and get a feel for them when playing your round of golf on the simulator. Besides seeing you ball flight, there is an area on the screen that shows the trajectory of your shot as it happens, and another area that shows a cluster of the disbursement of your shots. Statistics. The following details of each shot are displayed. Total distance, Carry distance, Launch angle, Ball speed, Distance to the pin, and deviation off target line or pin. You’re never too young to start learning! Dru teaching 4 year old grandaughter Gwen. Pretty good finish position – belly button pointing to the target. 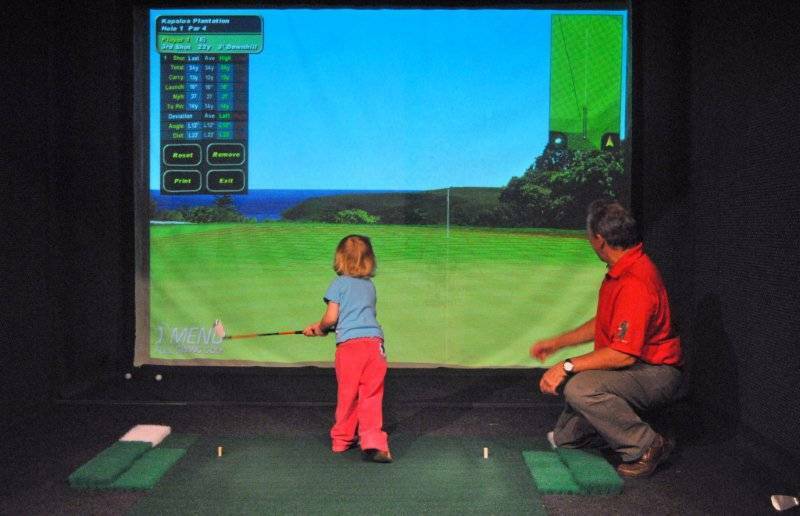 Full Swing Golf uses a patented duel infrared tracking system with 688 independent sensors exactly 1½ inches apart, (approximate size of a golf ball). This allows the system to see the slightest difference in ball flight performance, and accurately display the exact flight in real time. Visit Full Swing Golf at www.fullswinggolf.com for more information.